How to submit a Sitemap to Google? In order to ensure the fastest and smoothest possible indexing of your pages on Google, it may become important for you to create a sitemap of your domain during search engine optimization and then to submit this sitemap to Google. 1 But what is a Sitemap? 5 What makes submitting the Sitemap to Google so important? 6 Do I need a Sitemap? But what is a Sitemap? A sitemap – the name already suggests it – is nothing more than a detailed map of your website, in the form of a complete list of your URLs. Once you submitted the sitemap, it will be easier for Google to find and index all of your individual pages. The more recent the data in the sitemap is, the better. In order for your sitemap to work at all, you should first make sure that you have verified your domain in the Google Search Console. After your domain has been confirmed in the Google Search Console, you can submit your sitemap to Google. With BAVOKO SEO Tools you are able to create a complete sitemap of your WordPress website within a few minutes, which is also automatically updated as soon as you make changes to your site. In addition, the current sitemap is also automatically transmitted to Google if changes are made to your pages. 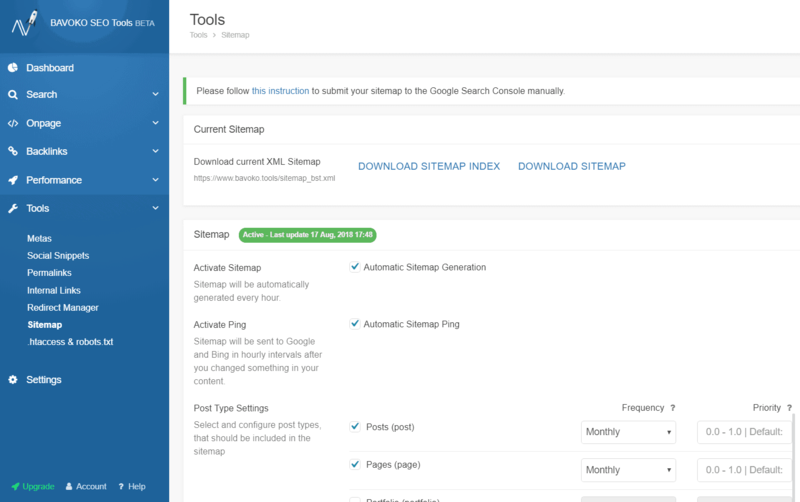 In the “SEO Tools” section of the plugin you will find the tab “Sitemaps” where you can start the setup. After you have checked the box “Activate Sitemaps”, you can now select which of your WordPress Post Types should be included in the Sitemap. Click on “Update Sitemap Settings” to save your settings. After it has been created with BAVOKO SEO Tools, your sitemap must be sent to Google. To do so, you can simply use the Google Search Console and store the sitemap there with a few mouse clicks. Click on the “Sitemaps” button within the menu on the homepage of the Google Search Console. Enter your sitemap URL into the text field. Simply send the sitemap to Google by clicking on “Submit”. For further information about your sitemap URL you can read on in this article. Even though BAVOKO SEO Tools makes your work with the sitemap considerably easier by immediately notifying Google of changes on your pages, you should still store your sitemap directly in the Google Search Console. Here you can make various additional settings to your sitemap, check it for eventual errors and have an overall easier time managing it. What makes submitting the Sitemap to Google so important? As mentioned above, sitemaps are mainly used to tell the search engines – primarily Google – which URLs do exist on your website and where exactly they can be found. Normally the big search engines manage to find and index the single pages of your domain without any problems. However, if your internal link structure is poor or if you have a particularly large number of pages, some of your pages may be overlooked and may not appear in the index right away. 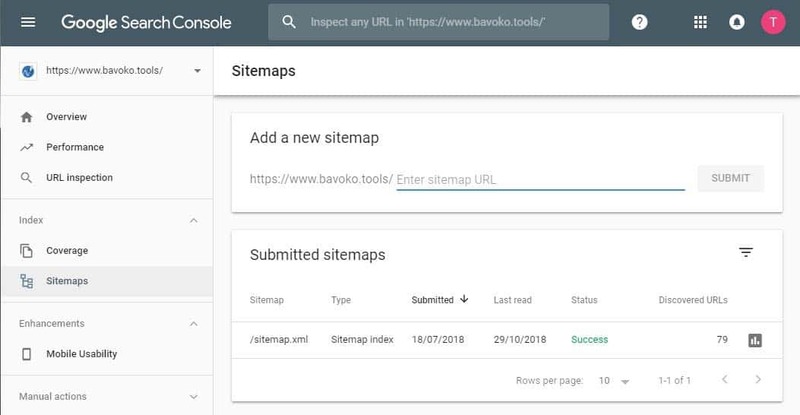 BAVOKO SEO Tools gives you a simple way to create a sitemap of your WordPress website and to directly submit any changes to Google, so that web crawlers can capture every “corner” of your website . By automatically updating and submitting the sitemap to Google, which is possible in BAVOKO SEO Tools, you significantly reduce the indexing time of new or revised pages. Submitting a sitemap of your website to Google is certainly not a disadvantage for you, but it is not necessary for every website to run a successful search engine optimization. The more individual pages exist on your domain, the more likely it is that Google’s web crawlers will not be able to find and index new or freshly edited pages until some later crawls. If the single pages of your website are not referring to each other, they may also be overlooked within the content pages. Include these pages in the sitemap to avoid this in future crawls! To optimize your internal link structure, BAVOKO SEO Tools also includes the very useful Internal Links Manager. Crawlers of major search engines such as Google work their way from page to page by following the links placed there. If your site does not yet have referring links from other sites, some of your sites may not be indexed right away. With just a few external links referring to your site, the crawlers rarely visit your pages. This may be one reason, why changes to your pages are not registered by Google until much later. To support the indexing of your WordPress website, it is almost always advisable to create and submit a sitemap to Google. With BAVOKO SEO Tools you only need a few mouse clicks for this important step, always have an up-to-date sitemap at hand and in addition you have access to numerous other tools for successful SEO.